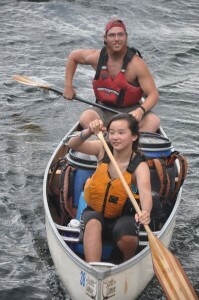 Coureurs de Bois (ages 12-13) have a 7 night / 8 day canoe trip and experience the rugged beauty of the greater Temagami district. Following several days of in-camp fun and instruction, they paddle their way through history, on lakes such as Obabika (and its nearby Old Growth forest), Lady Evelyn (and up to the slides at Centre Fall), Shishkong (with its legendary Stone Pillar), Diamond (with its ancient pictographs), Tupper (climbing mysterious Maple Mountain), and Elk (with its nearby Mountain Chutes). Four-week Coureurs de Bois have similar in-camp days, but travel on trips of about 16 days. They might voyage circularly through the trout streams, by spectacular waterfalls, of the Lady Evelyn Smoothwater Wilderness Park, or down rivers and lakes to Georgian Bay. Schedule and pricing for the Coureurs de Bois program.